Leeds boxer Adams will take on Mexico’s Arely Mucino at the Royal Albert Hall on March 8 as she fights for the WBO world flyweight title. The 36-year-old became the first woman to claim an Olympic boxing title, winning it on home soil in London 2012. She went on to retain it four years later after beating France’s Sarah Ourahmoune in Rio following her 2014 Commonwealth gold. “Winning a world title is what I got into professional boxing for,” she said. “I believe it is my destiny to do so and ultimately unify the division. Winning a world title is what I got into professional boxing for. I believe it is my destiny to do so and ultimately unify the division. Her two Olympics wins made her the first Britain to retain an Olympics championship since Harry Mallin in 1924. Adams’ meteoric rise from an amateur to a pro’ thrust her firmly onto the world stage and in 2007 she made her first international appearance, representing Great Britain at the European Amateur Championships in Denmark. She was awarded an OBE in 2017 in recognition for her contribution to boxing and became the first openly LGBT person to win gold in the sport with her 2012 success. 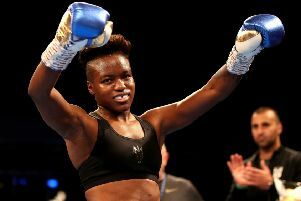 She will fight for her first world title since turning pro’ two years ago and is yet to be defeated since entering elite sport, winning three of her five professional bouts by knockout. Adams won her first professional bout with a 40-36 points victory over Argentina’s Virginia Carcamo in April 2017. Her victories put her among some of the most prestigious athletes in Britain, marking an incredible journey from growing up in Burmantofts – to becoming four-time English amateur champion and mounting two successful Olympics gold-medal bids. While she was growing up in the 1980s, women’s boxing was banned in the UK. This was not lifted until 1996, and Adams’ first win came at the age of 13 in the year female boxing became legal. On winning her first Olympic gold, she said: “I was trying to hold back the tears. 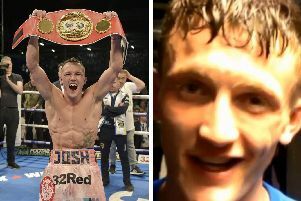 “Taking the gold medal back to Leeds will be very special. “I think this first Olympic women’s boxing tournament has raised the profile of our sport, and I think a lot of girls are going to get into boxing.” The fight on March 8 – the first time the Royal Albert Hall has staged a world-title event for two decades – will see Adams come up against three-time world champion Mucino. The 29-year-old won the WBO title in February last year and holds a record of 27 wins, two draws and three defeats during her 10 years as a professional. The bout in March will be the co-main event alongside undefeated British heavyweight Daniel Dubois’ fight against Romanian Razvan Cojanu. Dubois will be following in the footsteps of Lennox Lewis and Frank Bruno by competing at the world-famous venue.